Written by Daniel C. Esty and Andrew S. Winston. Since “Going Green” is big business these days, it is nice to read this book Green to Gold, for which the authors, who are experts from Yale, have done extensive research within the industry, and had an opportunity to get access to a lot of companies. 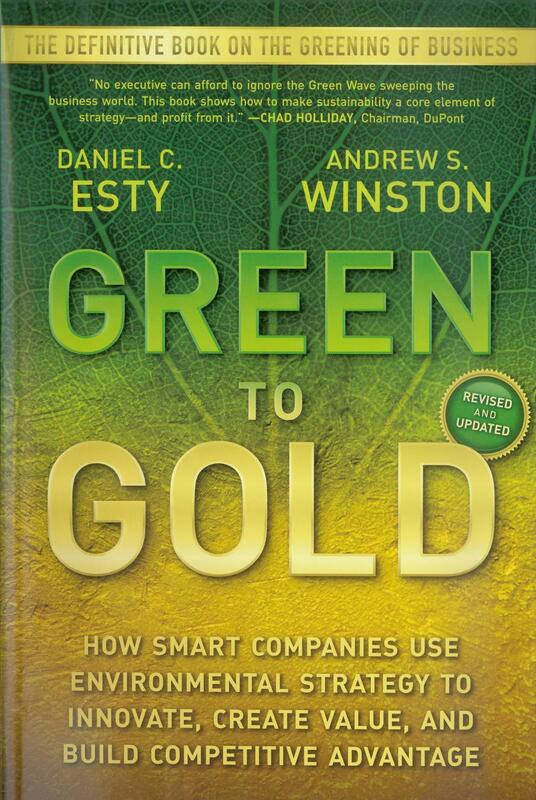 First published in 2009, Green to Gold shows what companies have made mistakes, and did or did not fix it, and what companies take Green to a next level. (there probably have been changes made by these companies since then, but that doesn’t mean you can’t take the tips and tricks for your business from it, and also see where you can go wrong, and make sure you don’t) It is the perfect guide for the Green entrepreneur, and if you want to make your business more eco-friendly. By finding your “eco-advantage” as they call it, you not only make your business greener but can also make it more profitable. How big or small your company is, it does not matter, Green to Gold has many tips to make your business Greener & Better! The book is also printed on acid-free post-consumer recycled paper with soy ink. You can order it on Amazon or check the website.